An A.P. Dearsley stage play was the basis for the seven-reel British comedy And the Same to You. Brian Rix stars as the pugnacious nephew of clergyman Sydney Mullett. Stuck with the name "Dickie Dreadnought," Rix feels he has no choice but to pursue a career as a boxer. To mollify his uncle, Rix pretends to be the soul of religiosity, while his tough-talking manager William Hartnell poses as a Man of the Cloth. 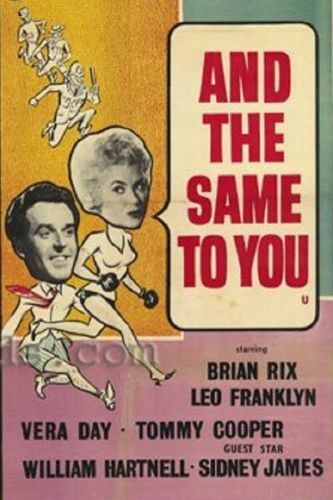 The script for And the Same to You was penned by melodrama specialist John Paddy Carstairs and veteran comic actor John Junkin (the too-tall road manager in A Hard Day's Night).